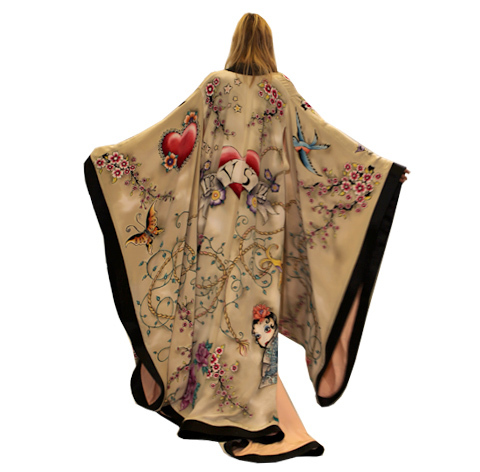 I am loving the latest work from my childhood friend, the artist Jeff Fender, whose hand-painted silk kimono was the centerpiece of the latest Victoria’s Secret runway event in New York. Jeff and I have been friends since our days in junior high and, let me be the first to add, while his talent is obvious, it is in no way shocking to see him taking the limelight with the likes of Tom Ford (Jeff worked on his top-secret couture lingerie line) and Broadway. Even as young children, it was a given — he would be famous. His Brooklyn studio is known for the kind of detailed work for which Parisian couturiers were once famous. Jeff jokingly calls it his “craft show.” We disagree. It is genius. The Victoria’s Secret Fashion show will air on CBS November 30th.